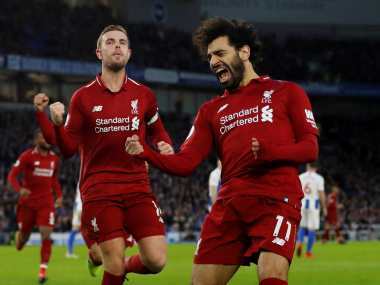 London: Chelsea rode their luck to salvage a 1-1 draw at Liverpool thanks to Willian's late leveller, while Manchester United cut Manchester City's Premier League lead to five points with a 1-0 win over Brighton on Saturday. Antonio Conte's Chelsea were five minutes away from suffering a major blow to their hopes of defending the title after falling behind to Mohamed Salah's opener at Anfield, but grabbed a point thanks to Willian's leveller. "I saw a good reaction from my players despite long travel and little rest for them. 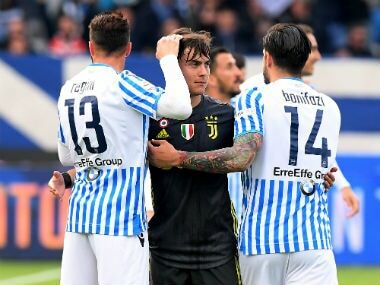 They would not accept defeat," Conte said. "It's not simple to play at Anfield. We tried to fight and tried to win." Salah, who spent an unsuccessful spell with Chelsea from 2014 to 2016, returned to haunt his old team in the 65th minute. Chelsea midfielder Tiemoue Bakayoko miscued a clearance, giving Alex Oxlade-Chamberlain the chance to prod the ball into Salah, who slotted a low finish past Thibaut Courtois. It was Salah's sixth goal in his last five appearances — and his 15th for Liverpool this season — but he opted not to celebrate, apparently out of respect for the more than 300 Egyptians killed in a terror attack this week. 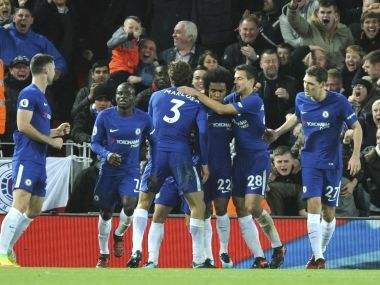 But just as the champions were facing their first defeat in five league games, in-form Willian came off the bench to rescue Chelsea with his 85th minute equaliser. 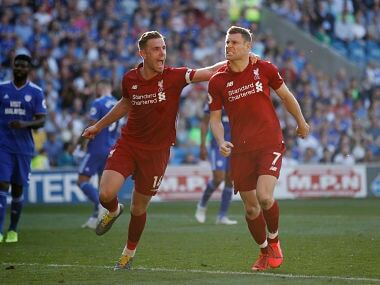 The Brazil winger, who scored twice in the Blues' 4-0 Champions League win at Qarabag midweek, found space in the Liverpool penalty area for cross that he sliced and saw loop fortuitously over Simon Mignolet into the far corner. While Chelsea finished the happier side, the draw did little to enhance either club's title prospects. The third-placed Blues are eight points behind leaders Manchester City, who travel to Huddersfield on Sunday, while Liverpool remain fifth and sit 11 points off the top. "You need a bit of luck and we didn't have it again." At Old Trafford, Jose Mourinho's United bounced back from their surprise Champions League defeat at Basel in midweek to win their 39th straight home game in all competitions and equal a 51-year record set by Sir Matt Busby thanks to Lewis Dunk's second half own goal. United made seven changes from the Basel loss and found it hard to break Brighton's stubborn resistence, before finally nabbing the crucial goal in the 56th minute, putting Mourinho's team just one game away from a club record 40 home wins in a row. Dale Stephens headed Marcus Rashford's corner as far as Ashley Young on the edge of the area and his shot deflected off Dunk and arched over Brighton keeper Mat Ryan. That was enough to secure United's second consecutive league win as they try to keep pace with City. "I think we were more spirit and heart than quality. My boys they didn't play well but they gave everything," Mourinho said. "For me probably Brighton deserve more than the result they got." Tottenham's bid to win the title for the first time since 1961 is in tatters after a 1-1 draw with lowly West Bromwich Albion left them 10 points behind City. 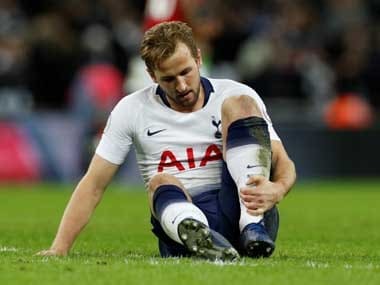 Spurs have had mixed results at Wembley since moving into their temporary home while White Hart Lane is rebuilt and once again they lacked a cutting edge against supposedly inferior opponents. West Brom, led by caretaker boss Gary Megson following Tony Pulis' sacking earlier this week, took a shock fourth minute lead. Salomon Rondon sprinted onto Jake Livermore's pass, held off Davinson Sanchez and notched his first goal since September with a scuffed shot that trickled past Tottenham goalkeeper Hugo Lloris. Tottenham laboured for long periods but equalised in the 74th minute when Kane converted Dele Alli's cross for his 15th club goal this season. West Brom are without a win in 11 league games, while Tottenham have failed to win their last two in the league. Mamadou Sakho gave Crystal Palace their second league win this season as the French defender's last-gasp goal sealed a 2-1 success against Stoke. Watford handed Newcastle a fourth successive defeat with a 3-0 win at St James' Park. Swansea manager Paul Clement faces a fight to save his job after his struggling side were held to a 0-0 draw by Bournemouth.